Have you ever cut into a tomato and found white squiggly looking things inside? These are not worms or aliens that made their way to the center, but rather seeds of the fruit that have begun germinating. It is called Vivipary, Latin for Live Birth. It is the term for plants that begin growing while still inside or attached to the mother plant.It is common in certain varieties of tomatoes, peppers, apple, pears and some citrus. Same tomato a few days later. This tomato probably was a bit older and sat on the counter for a while in a warm kitchen. Vivipary happens when the hormone controlling the seed dormancy is exhausted or runs out, letting the seed grow in the moist environment inside the fruit. This warm, moist environment is perfect for germinating seed to grow. If the tomato was left uncut in the warm conditions, the new plant sprout would eventually poke through skin of the now decomposing tomato. These new plants can be potted up and grow into a large tomato plant and even produce tomatoes. The tomatoes will not be a clone of the mother plant, because it grew from a seed that had to be pollinated by another tomato flower, introducing new parent genes into the seed that will produce the new plant. The tomatoes off of the plant are entirely edible and quite possibly delicious. Check out the seeds inside your fruit or vegetable the next time you slice into it. I have a tomato that has sprouted several vines. What’s the best method of planting them so they survive outside the original tomato? Carefully remove the vines with the roots intact and plant the individual plants into a pot with potting soil. These are just seeds that germinated inside the plant instead of in soil. Is this a result of new-fangled tomatoes species which have f.i. a longer shelf-life? A longer shelf life could give the seeds a longer time at the correct temperature and moisture level allowing the seed to germinate. The outside flesh did not rot keeping the seed happy and warm. 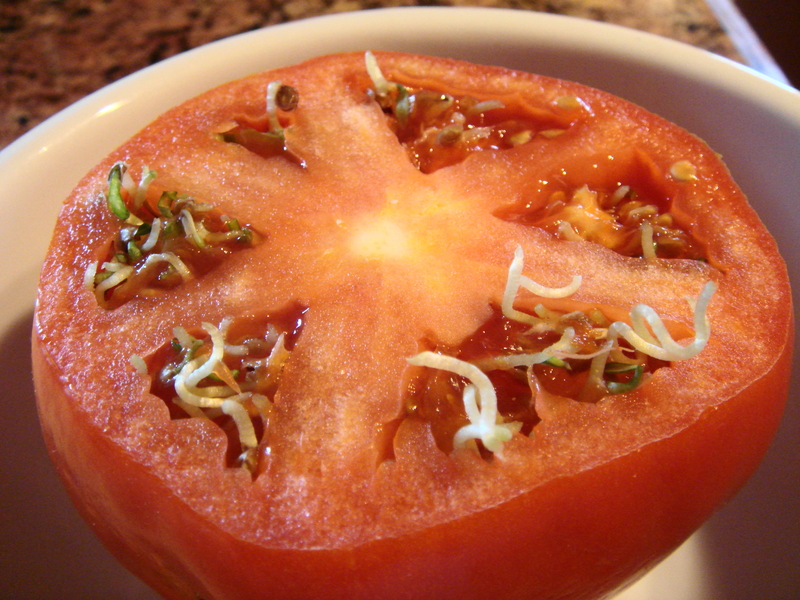 Should you eat a tomatoes with internal sprouts ? 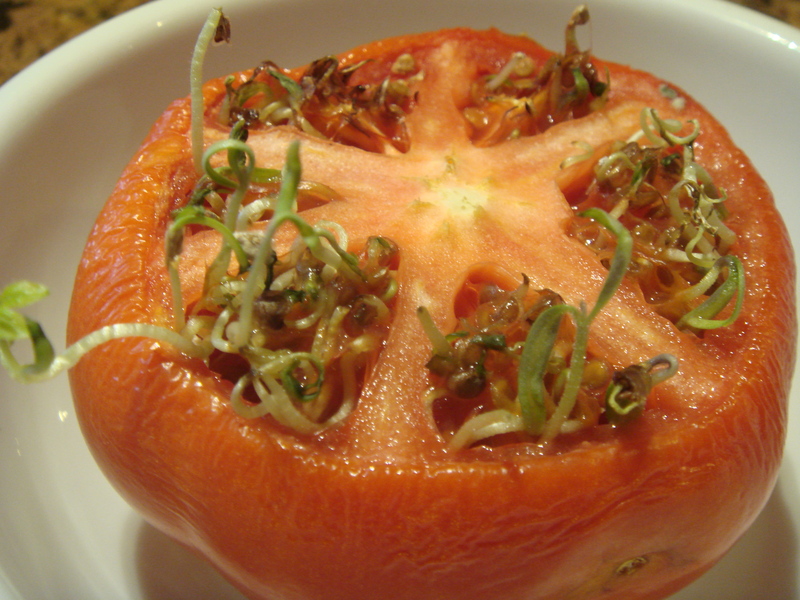 It is perfectly ok to eat tomatoes with seeds which have sprouted inside of the fruit. It is an indicator that the tomato may be a little old, affecting flavor, but it is still totally edible. i am trying to plant tomatoe seeds that have sprouted inside the the mother tomatoe and are approx 1/2 to1 inch high and dont know how . do i cover the whole tomatoe in potting soil or dig out the sprouts and plant them outside the mother seprately in potting soil ? Any suggestions………help green thumb! Yes, you can pot up the new sprouted seedlings in potting soil and treat them like houseplants. Place them in your sunniest window. Tags: germination, tomato, tomato seeds, vegetable growing, Vivipary, What's in my tomato.